Classroom Closet For Teachers Features Two Adjustable Shelves That Can Be Adjusted In 1-1/4" Increments For Customizable Storage Options. Doors Can Be Locked And Unlocked With Keys For Enhanced Security. Full-Length Piano Hinges Prevent Small Fingers From Being Pinched When The Door Is Opened Or Closed. Dowel-Pin Construction Prevents Weakening At The Joints. Kickplate Prevents Children From Losing Their Favorite Toys Underneath. Truedge Is Permanently Thermo-Fused To The Edges To Prevent Chipping. 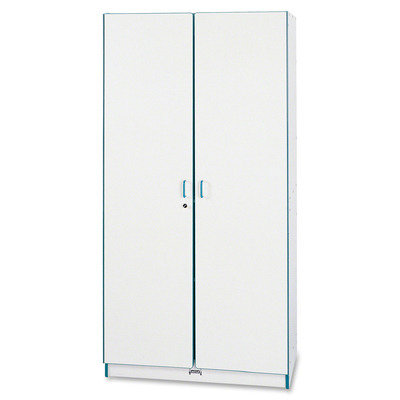 Kydzsafe Rounded Edges Allow Children To Play Safely Without Getting Hurt By Sharp Edges Or Corners..
Classroom Closet For Teachers Features Two Adjustable Shelves That Can Be Adjusted In 1-1/4" Increments For Customizable Storage Options. Doors Can Be Locked And Unlocked With Keys For Enhanced Security. Full-Length Piano Hinges Prevent Small Fingers From Being Pinched When The Door Is Opened Or Closed. Dowel-Pin Construction Prevents Weakening At The Joints. Kickplate Prevents Children From Losing Their Favorite Toys Underneath. Truedge Is Permanently Thermo-Fused To The Edges To Prevent Chipping. Kydzsafe Rounded Edges Allow Children To Play Safely Without Getting Hurt By Sharp Edges Or Corners.